When eleven goalkeepers arrived at Newcastle Airport, little did we know what lay ahead of us! The group outside their hotel. We had a great week, straight from the off it was nonstop, action packed and I hope exciting! Training that first morning, the first ‘Academy’ session on English soil and considering jet lag and the travelling the day before, the attitude, application, commitment and standard of goalkeeping was ‘1st class’, something that continued throughout the week. From training it was straight to St James Park for Newcastle United v Blackpool, a classic encounter in a bygone age. Even today, 47,000 including 14 from Vancouver provided a great and never to be forgotten atmosphere. 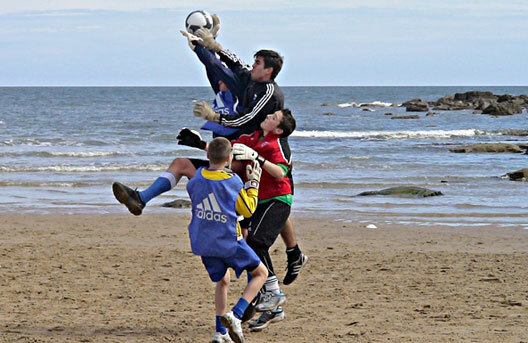 A ‘Coaching Day with Coach Sadler’, the morning session was on the beach, a new experience for some! Another new experience was Coach Sadler, Adam Sadler, former Newcastle United Goalkeeping Coach like Simon and an ‘old boy’ of Simon Smith Goalkeeping, as is Coach Mike. Fish and chips for lunch – a sportsman diet! Rest and back out for another session with Coach Sadler before diner. On the beach at Tynemouth. A ground tour of St James Park, empty this time….pictures by the pitch, in the dugout and in the press room….very informative. Training again was late afternoon for the boys, whilst the girls went training with Newcastle United Ladies, an experience they really enjoyed. Day 4 was coaching with Coach Ben, Ben Smith, a professional goalkeeper with Doncaster Rovers. Ben put on a great warm up and crossing session, he showed the intensity and speed that professionals train at and then chatted to the group about becoming and being a professional and what it involves and takes. A chat much appreciated and enjoyed by our visitors, giving a real insight into life as a professional footballer. Coach Joe, Joe De Oliveria, Goalkeeping Coach of Manchester City Ladies, took the late afternoon 1 v 1 session, providing great information and enthusiasm….enjoyed by all! Coach Sadler again, just one session today for the boys. The girls trained with Newcastle United’s Ladies again at Newcastle United’s indoor facility at Little Benton. This was supposed to be the ‘big finale’ but by now due to the volcanic eruption in Iceland we knew our guests were staying a little longer. A late morning session before early diner at the local Italian restaurant and then another visit to St James Park for the Youth Cup Semi Final second leg v Aston Villa, unfortunately for the adopted Newcastle United fans from Vancouver, Aston Villa managed a 1 v 0 victory to see them into the final. It gave the group an excellent opportunity to see the standard required to play in England at U18 level. This was supposed to be the ‘sad goodbye day’ at the airport but instead it was another week of training, coaching and cultural visits to Bamburgh Castle, Chillingham Castle and the Metro Centre! It was a great trip, a massive thanks to Angus for having the idea and organising the travel. Thanks to the ‘coaching staff’, Adam, Ben, Joe and Mike, their level of technical detail, coaching, teaching, professionalism and enthusiasm meant all benefited from their expertise. We must also thanks the staff at the Premier Inn, North Shields, who under the circumstances bent over backwards and ‘washed underwear’! To help us, particularly in the second week, above and beyond the call of duty! A great group of goalkeepers, both on and off the field, a credit to themselves, their parents and Canada! Oh! Nearly forgot….Glenn, the best defensive ice hockey lineman we know, in fact, the only defensive lineman we know!! Your help was invaluable! 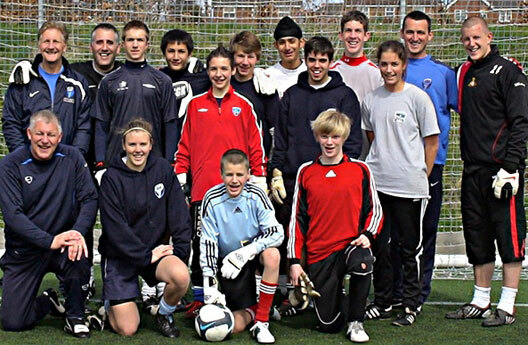 The message was ….come and experience goalkeeping and the soccer culture in the UK, then go back to Vancouver and put into practice what you have learnt during your stay.